Do you want 300 more monsters for your 5E D&D campaign? That’s a rhetorical question, of course you do. We’ve got a cosmic space dragon and an empire of ghouls from the upcoming Tome of Beasts to show you, because monsters are awesome. Tome of Beasts is a collection of more than 300 monsters with stats for Fifth Edition Dungeons & Dragons, and it’s being made by Kobold Press (they’ve designed some of the 5E adventures as well). They’ve got a bunch of cool stretch goals lined up for their already smashing Kickstarter, including the Book of Lairs, a PDF of creature-centric maps ready to be printed or projected for your gaming group’s enjoyment (or complete and utter slaughter). Here’s preview art for something called The Empty Cloak, and below that, a Clockwork Abomination. Kobold Press will be drawing on their years of experience designing monsters for other RPG systems, like the AGE system, 13th Age, and more. But now, all these fiends will be converted to 5E D&D rules, and frankly I think 5E could use a few more. “Everything from tiny drakes and peculiar spiders to ancient dragons, arch-devils, and demon lords. 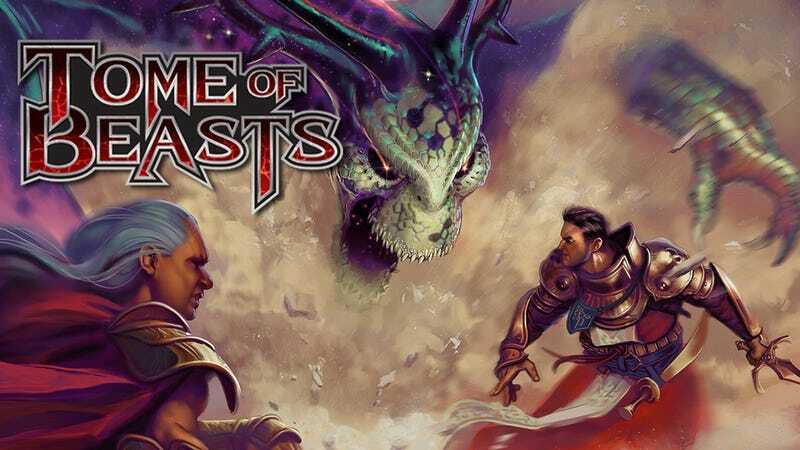 The Tome of Beasts covers a huge gamut of challenges, from basic vermin to world-shaking personification of malevolence, and everything in between!” is how they describe the situation on the Kickstarter page. To really get a feel for the creatures they’re designing, take a look at these two exclusive previews. The first is an underground empire of ghouls scheming to destroy and devour the surface dwellers; the second is a race of dragons who have glimpsed the unknowable and gone a little insane.